You can make your own seed and potting compost from leaf mold - nature's very own compost. You only have to look and smell the finished material to realise how good it is for growing plants. It has the ability to hold losts of moisture and this provides an ideal environment for seed germination. Moreover, its low nutrient content benefits the early development of healthy seedling roots. But you can add nutrient rich comfrey leaves to the material when preparing a mix for potting on or plant containers. In addition to use for seedlings, potting on and plant containers, leaf mold is ideal for mulching around shallow rooted moisture loving plants: e.g. especially fruit (Gooseberries, Red Currants...) rhododendrons, azaleas, primulas, ferns, Cyclamen and others. Any plants that benefit from a moist environment for root development will do better when leaf mold is incorporated e.g. seedlings of French Beans and Runner Beans. The end product may vary depending on the type of leaves used. I use leaves from broadleaved trees. You can also use leaves from conifers such as Pine, but the product will be be more acidic. Nevertheless that is just what you need for acid loving Rhododendrons and Azaleas. I don't recommend collecting leaf mold from woodlands. This is more likely to be contaminated with weed seedlings or potentially dangerous fungi. Also, it disturbs the environment. Simply gather leaves in the fall. Put them into a bag or bin and ensure that there are a few holes to let the air in. Leave them outside and let some water get into the bag as well but avoid water logging. After a year to 18 months the crisp yellowed leaves have turned into a black substance which has become populated by small invertebrae like Spring Tails, a few Woodlice and Worms. The finished Leaf Mold is a black fine looking material. Its granules are full of moisture. I find this leaf mold to be practically free of weeds probably because weeds seeds did not stick to the leaves. Although in the early stages it may contain potentially damaging fungi, all these have gone by the time it is properly finished. If you are growing Comfrey plants (as I recommend to organic gardeners) then you can place layers of Comfrey leaves in a bage between layers of ordinary leaves. I expect that you could use nettle leaves too. These additions break down to a compost with higher nutrient content. 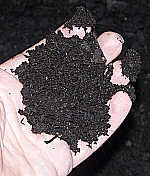 This resulting material can then be used to support developing plants in pots and containers. Also useful for indoor gardening and growing ferns, African Violets, Cyclamen and others.